Can’t get enough of BU5? Right after the bloggers bazaar, Bloggers United, together with SMX Convention Center’s Great Luxe Sale, will be holding The Fashion Blogger, the team’s very first seminar/workshop on fashion, photography, and blogging! 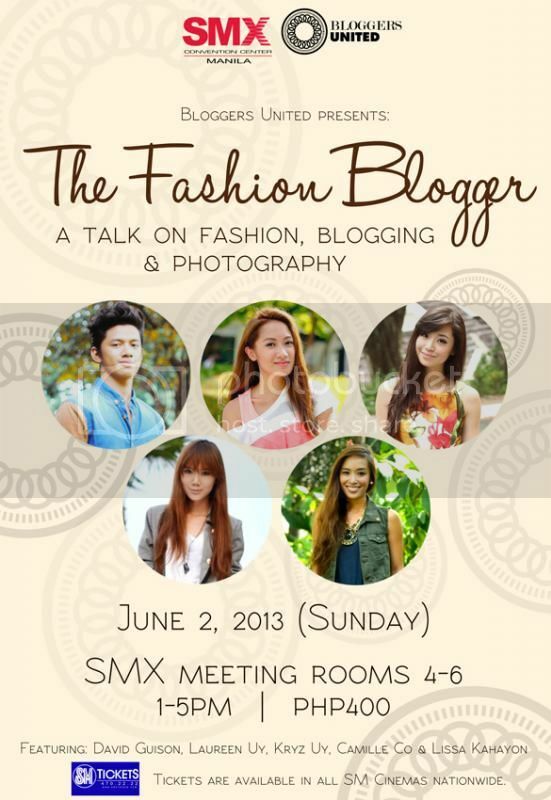 Meet and learn from fashion bloggers Camille Co, David Guison, Laureen Uy, Kryz Uy, and Lissa Kahayon on June 2, Sunday, from 1-5pm, at the SMX Meeting Rooms 4-6. BU organizers Aisa Ipac and Ana Gonzales will also be giving a talk on uncluttering your closets, styling tips, and fashion writing. Tickets are available for P400 in all SM Cinemas nationwide, and during Bloggers United 5. Wanna win Summer Siren Festival Passes for your Barkada?